"I put this together because I found myself using these same seasonings a lot in everyday cooking and I finally got tired of adding things separately! I use (with a tablespoon of olive oil) to season water before I steam greens or corn, to roast potatoes or yams (cut into 1/2 inch cubes and toss with olive oil), as a dry rub on meat for bbq, and in soups to add a little extra kick. 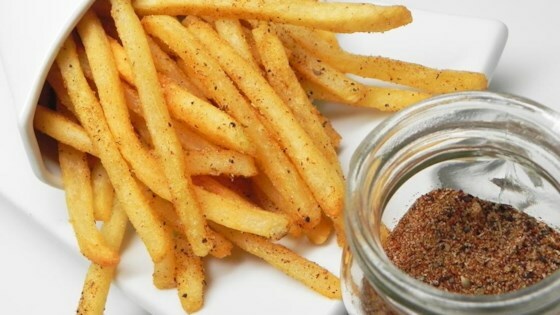 It tastes similar to the seasoning they use in some restaurants for French fries. I use it pretty liberally because I like extra spice, can be used more sparingly if you like less. Start with a tablespoon and make it yours!" Mix chili powder, black pepper, oregano, cumin, salt, garlic powder, onion powder, and cayenne pepper together in an airtight container.